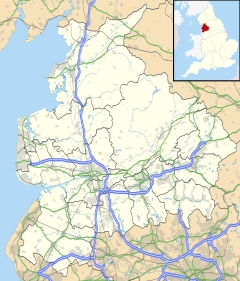 Haslingden /ˈhæzlɪŋdən/ is a town in Rossendale, Lancashire, England. It is 19 miles (31 km) north of Manchester. The name means 'valley of the hazels'. At the time of the 2001 census the town had a population of 16,849. Haslingden is the birthplace of the industrialist John Cockerill (1790–1840) and the composer Alan Rawsthorne (1905–1971), and was the home for many years of the Irish Republican leader, Michael Davitt (1846–1906). Haslingden Cricket Club is a member of the Lancashire League. Part of what is now Haslingden, along with that of the neighbouring towns of Rawtenstall and beyond that Bacup were part of the Forest of Blackburnshire, that part being the Forest of Rossendale. The Forest was a hunting park during the late 13th and 14th centuries; 'Forest' referred to it being parkland rather than being heavily wooded, as the forest declined much earlier, during the Neolithic period. In the 20th century the population declined from 19,000 in the 1911 census to 15,000 in the 1971 census. The 2001 census recorded a population of 16,849 living in the town. Like much of East Lancashire, Haslingden also has a long association with the textile industry. From the 16th century, after the old Forest of Rossendale was opened up to settlement, farmers raised sheep on the moorlands and made woollen cloth. Initially this was small-scale and local but towards the end of the 18th century cloth workers came together to work in small groups of houses. At the same time advances in technology meant that the first mills were appearing in the area. Most of these were small, water-powered buildings and Haslingden, with its elevated situation, wasn't a natural place for the development of these early mills. Locally they were situated lower down in the river valleys, such as at nearby Helmshore. The long association with wool meant that Haslingden and the other Rossendale towns were familiar with the processes of cloth production and so were able to switch easily to cotton weaving. Cotton was better suited than wool to industrialised spinning as its fibres were less likely to break than wool. Cotton cloth manufacture quickly became a highly successful industry, and its impact on the landscape and on the lives of its work force was enormous. Cotton weaving in the new factories was largely unregulated and the workforce kept almost at starvation levels. Hunger drove men and women to fight back, and mobs attacked the power-looms that were seen to be the cause of the decline in status of the work-force. In 1826 almost 3,000 people were reported as 'attacking machinery' in Haslingden. A troop of cavalry was stationed in the vicinity, and ring-leaders were arrested. It was reported from Haslingden in the same year, 1826, that 'a great majority of the unemployed must literally perish from extreme want'. By the 1850 steam power began to supersede water-power, and mills grew in size. Grudgingly a minimum wage was introduced and through the efforts of reformers, the churches and a few enlightened mill-owners conditions for factory workers slowly improved. Conditions were still harsh, despite the whole Rossendale area being known as the 'Golden Valley'. No longer dependent on the rivers as a source of energy, the mill owners were freed to build elsewhere, and Haslingden began to find that successful mills, such as Hargreaves Street Mill, could be built on its higher land. The long decline of the cotton industry began in the early years of the 20th century. During the First World War, India and Japan were able to develop their own industries, and after the Second World War, immigration - mainly from Pakistan - was encouraged to help bolster a failing industry. But by the 1950s, mills were closing at an ever-faster rate. The old buildings often re-occupied by small businesses specialising in other occupations. In the nineteenth century when the Cotton Industry was thriving it became a magnet for immigrants who, for various reasons, had arrived in Britain. In particular the port of Liverpool was a gateway for waves of immigrants and many of these were attracted by work in the mills. From the late 1840s a large influx of Irish immigrants forced out of Ireland by the Great Famine of 1846-1852, came to Lancashire and some ended up in Haslingden. At almost the same time, as a result of the political instability in Italy, Italians came to Liverpool and Manchester and a few families moved on to Haslingden. Similarly, various eastern European refugees fleeing Nazi persecution, settled in the area. Immediately after the war young women from Germany were brought over to work in the mills, and a few came to Haslingden and stayed. From 1950 onwards migrants were encouraged to travel from Commonwealth countries to work in the post-war textile industry. Initially this tended to mean young men who travelled from Pakistan, and later Bangladesh, fully expecting to return home after building up their savings. But by the 1970s, many were joined by wives and families and settled permanently in Haslingden. As a result, the town is now home to a substantial and vibrant community of people from a South Asian heritage, mainly Bangladeshi and Pakistani. Many of the families come from just a few villages - from the Attock and Mirpur areas of north-west Pakistan, and from Patli Union in the Sylhet region of Bangladesh. The town now houses two mosques and a considerable number of Asian grocers and other shops. There is also Apna (Rossendale) that provides classes, workshops and a meeting place mainly for South Asian women. It is based at the Dave Pearson Studio, and has a focus on Islamic arts, well-being, health and general education. A civil parish was created in 1866 from the township of Haslingden in the ancient parish of Whalley. A local board was formed for the town in 1875 and the district it governed was extended to cover parts of the townships of Henheads, Higher and Lower Booths in the parish of Whalley, and Musbury and part of Tottington in the ancient parish of Bury. Subsequently, Haslingden was incorporated as a municipal borough in 1891 and in 1894 the civil parish was extended to match the borders of the borough. Following the local government reorganisation in 1974 Haslingden became part of the Borough of Rossendale. Haslingden's Anglican parish church, St. James', was built in the 18th century on a site occupied by a church building since at least 1284. In that year a deed of gift of the Earl of Lincoln to the monks of Stanlaw granted them the parish of Whalley. The church is considered to be the highest parish church above sea level in England. When they later took possession and had a valuation of its assets done, they recorded at Haslingden one of the parish's seven independent chapelries. Beside the Memorial Gardens, the Manchester Road Methodist Church is a classic building with an Italian-inspired interior. The Public Hall was opened in 1868 and built by a private company formed by 'gentlemen representing the working classes and temperance movement'. It was bought by the town council in 1898 but is now largely unused. Used for 50 or more years by Rossendale Amateur Operatic Society, and other local groups, the hall was closed by Rossendale Council in 2005 after an audit commission found them to be the worst council in the country and this was shown in the published league tables of the time. The hall has since been sold by the council to a group representing the Asian heritage community and is in the process of being turned into a mosque (2009/ 2010). The public hall was once a venue of Winston Churchill during his early political career. Emmeline Pankhurst once addressed the people of Haslingden from the stage and, after the Battle of the Somme in 1916, it was a temporary hospital for the survivors of the Accrington Pals who were sent home for treatment. Originally Haslingden Mechanics' Institute and opened in 1860, it became the public library in 1905. A blue plaque commemorates Michael Davitt. The young Davitt migrated to Haslingden with his family in 1840 as a result of the family being evicted from their tenant farm by cruel a British Landlord. He began working in a cotton mill but at the age of 11 his right arm was entangled in a cogwheel and mangled so badly it had to be amputated. When he recovered from his operation a local benefactor, John Dean, helped to give him an education. He also started night classes at the Mechanics' Institute and used its library. Michael Davitt's family home from 1867–1870 on Wilkinson Street is now marked by a memorial plaque. Amongst the library's collection is a early photograph (c. 1892) of Thomas Frederick Worrall labelled Tom Worrall, artist. Worrall's depiction of the Old White Horse Inn (long demolished) is available on the Watercolour World web site. Haslingden was once connected to Accrington and Bury by railway (Rush, 1983). The East Lancashire Railway built a station here, which remained open to passengers under British Railways until 7 November 1960 and to goods until 2 November 1964. The withdrawal of the passenger service was therefore not a victim of Dr. Beeching. The Bury – Accrington line itself remained in use until December 1966. Much of the trackbed of the railway is no longer visible, with the A56 by-pass built over it between Grane Road and Blackburn Road, however, the line can still be traced through Helmshore towards Stubbins where several magnificent viaducts still remain. The East Lancashire Railway Preservation Society was originally established at Helmshore Station in the mid 1960s with the aim of reopening the railway line to Stubbins, the project was abandoned with the organisation relocating to Bury in the 1970s and eventually reopening the Rawtenstall to Bury line. The town centre is home to the famous Big Lamp originally erected in 1841 and from where all distances in Haslingden are measured, although the original lamp has been replaced by a replica, the original being lost after being taken to America. Cissy Green's Bakery can be found on Deardengate. People visit from across Lancashire to sample the handmade pies which are still made to the original 1920s recipe. To the north of the town is the Holland's Pies factory, and Winfield's, a large warehouse-style retail development selling footwear and clothing, and promoting itself as a family day out. Haslingden's War Memorial is unusual in that it has no names recorded on it. To the northeast there is a 2 kW digital television transmitter serving a wide area. There is an extensive area of moorland to the west of Haslingden. These moors are divided into Oswaldtwistle Moor and Haslingden Moor. The area forms part of the West Pennine Moors. Plans were made in 2007 to build a wind farm consisting of twelve wind turbines on the moors. This attracted both support and opposition, but the plan was approved by councillors in 2010. Further developments have yet to take place, and the plan remains controversial. Victoria Park has a bowling green, children's playground, skateboard park and ball court. The top of the park affords views of Musbury Hill. The Panopticons competition was launched in May 2003 by RIBA Competitions. The Halo artwork designed by John Kennedy was selected and opened in 2007 and is sited in the hills above Haslingden as the centrepiece of a reclaimed landscape. It glows at night with an impressive viewpoint. Sir Rhodes Boyson, former Conservative Minister in Mrs Thatcher's government, former Councillor on Haslingden Borough Council, and former Head Teacher of Lea Bank County Secondary Modern School, Rawtenstall. Michael Davitt – Irish Republican. In 2006 a revamped memorial to Davitt was unveiled by the Irish President Mary McAleese in Wilkinson Street as part of the Davitt centenary celebrations. Clive Lloyd, West Indies and Lancashire C.C.C. cricketer, who also played for Haslingden in the early days of his career. Vinoo Mankad, Indian cricketer, who played for the town's Lancashire League cricket team. William Roache, actor best known as Ken Barlow on Coronation Street. Robert Scott, recipient of the Victoria Cross during the Second Boer War. Choppy Warburton (1845–1897) born in Coal Hey, just off Lower Deardengate, was a record-breaking runner and a cycling coach. There are frequent claims that he drugged riders to make them ride faster. Painted by Toulouse-Lautrec. ^ W. J. Lowe, The Irish in Mid-Victorian Lancashire: The Shaping of a Working-Class Community (Peter Lang, 1989). ^ Horse + Bamboo: Transcriptions from Interviews with first generation immigrants. Heritage Lottery Fund 2015, available at local libraries. ^ "Rossendale Census Demographics United Kingdom". localstats.co.uk. Retrieved 16 May 2017. ^ "SA Communities – Different Moons". differentmoons.org. Retrieved 16 May 2017. ^ a b "Haslingden CP/CP through time". visionofbritain.org.uk. GB Historical GIS / University of Portsmouth. Retrieved 25 July 2013. Wikimedia Commons has media related to Haslingden.